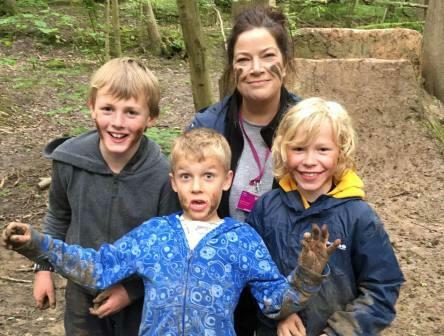 We see the return of the ever-popular Wild Play Days holiday playscheme this Easter holiday. Based at YMCA Hawker in Kingston, the outdoor camp for 7-11 year olds gets kids off their screens, out in the fresh air and learning a thing or two about nature. Each day, we take your child to a fabulous outdoor location, like Richmond Park, Bushy Park and Esher Common for fun activities that will fire up their imaginations, and build up their confidence. From roasting marshmallows, den building, whittling, camp fire building, woodland art and exploration, your child will never be bored, will make new friends and learn just why playing outdoors is so amazing. Our qualified childcare team will help them build the best rope swings and teach them the easiest way to climb trees, and show them how to have fun outdoors whilst being safe at all times. Your child will trek through the open woodland, leaping in puddles, soaking up the atmosphere and burning off energy. Wild Play Days takes place even when it’s wet, so you child will need warm comfortable gear, good waterproof clothing and sturdy wellies. They won’t come back clean, but they will be happy! Wild Play Days runs this Easter from 9-11 April, 8.30am-4.30pm/6pm and costs just £30/35 per child, per day.